Well, after 3450 miles my S20s are toast. So i thought id shed a little light on them since I don't see many other people runing them. The s20s are supposed to be a fairly aggressive street tire. With that in mind i expected turn in to be pretty quick. The contrary was true with this set, i feel like i have to muscle them into a turn, where other model tires would fall over easier. (this could have probably been adjusted out with suspension?) However once the bike was leaned over it felt very stable on these tires. the profile also allows for more angle than the 2CT's. When i switched from the 2cts i had no strip left at all, then when i got on the s20s there was almost 3/4 of an inch i wasnt using. These tires heated up very quickly, quicker than any other tire ive had. However, as the last month of riding here has been pretty cold i noticed the tire does not hold its heat well. So keep that in mind if your in colder environment its annoying because your tires wont keep the heat in them. The grip on these guys are supurb, rain is a non issue. The compound seems much softer than pilot power 2cts(which is what i came from, i thought this was a comperable compound to that tire) I never had any issues with grip with these tires. Never once did i think there wasnt enough grip to keep me rubber side down. If you have any questions LMK, hope this helps someone. nice review. i was wondering about those tires. I used to run pp, the 2ct , then the pures. i liked the pures but have u ever tried the supercorsa sp's? imo the best combination of quick turn in, warm up, stability and decent wear. they dont do too well in cold or wet imo though but a BIG step up from the pures as far as dry performance. Well, you just convinced me to NOT buy a set. I'll stick with the Q2s, or better...the Q3s come out in June. Im going to run a set of 2cts again until the q3s come out aswell. Wow. What pressure was the rear at on that highway run? I'm a little late here. I just put a set on last weekend. Haven't really put any miles on yet. I was hoping to get at least twice your milage out of them. By summer I will be able to fork over the $ for some Z8's. The M20's cost 219.00$US for the set, so I didn't get hurt tooo bad. What is your riding style? 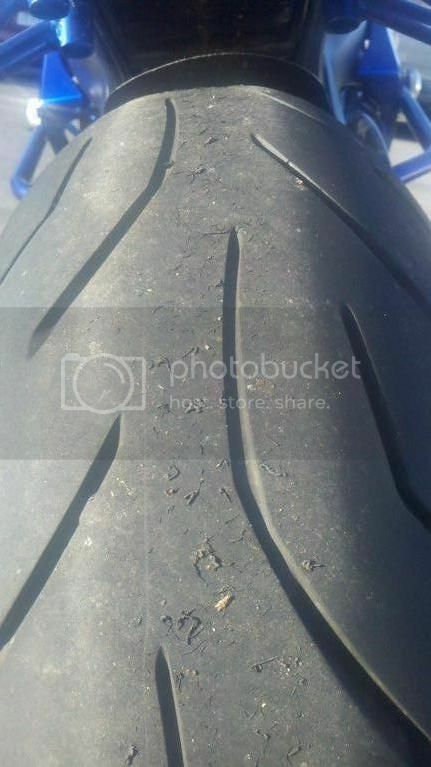 I ended up riding almost exclusively 2up the entire time I had the S20's on my bike, including a couple trackdays. I managed to get the same 3400ish miles out of the rear but my front lasted to nearly 5600 miles. Both of which were pretty decent mileage for how and where I ride. Only the Q2 and M3 give me more rear tire mileage. I thought the tires performed quite well, especially on the track. Whee! I NEVER carry a pillon. I'm seriously considering taking off the rear pegs. Every Oz. counts. I almost went on a track once. Almost. I had a SECA 900 that I dropped on the way home from the stealership. It felt funny after that so a few months after I sat down with a bud that built frames for Choppers (Custom Harlies) and he built me a new frame. It had a little more trail in it so the 900 was more stable. That 900 was a monster at corner entry. Braking reduced the trail, which led to rolling in too fast and losing the line. IIRC (it's been about 30 years and memory IS the 2nd thing to go!) we added about 10mm of trail. Anyhow, the bike was very polite after that. Great brakes for the day and With my new frame I could go deeper in the corner before braking and drive harder on exit. The bike was very quick and I used to bully the Suzukis and Kawasakis. So there was a track day at the local track ( I raced only on the street, Rock Creek Park and out to Brighton Dam mostly) and I had been challenged by a GPz turbo rider. HE only raced on the track. OIL and water thing. So I though I would sneak in a practice ride, since I considered him a better rider and his bike had a little more power. I had bigger 'nads so on the street I win, but on the track it's technique and power. So I walk into what looks like the lobby to see if they had a list of rules. No rules on the street except stay in front and the 11th commandent. There were 3 or 4 guys standing in front of the counter in tight leather oufits arguing over who got to buy the last 'Brazilian Buns' video, or it's contemporay version. VCR's were state of the art at that time and very shiek. Not my sort of fellows. Good guys, no doubt, the sort that will make sure your drink never gets empty and are willing to push in your stool when you leave but not my type. I left and never looked back. So I might get my majic 10,000 miles. Haven't ever but hope springs eternal. seems like bridgestone is going in reverse with the tires. I miss the old bt-002rs. perfect combination of great turn in, mid corner stability, no stand up in a lean while braking and decent tire life. that is for what a high performance tire can offer in miles. I'm leery of dunlops. every dunlop I've had was a POS. (that's a capital POS). I might as well had a wood tire. they slid in every condition you could ride in. it didn't matter if it was hot and dry they'd slide like they would in a cold rain. Your review is to a Tee. I didn't even get that many miles though. But, I literally felt "GLUED" to the road! They are awesome except for the wear issue. They should be harder in the middle. I had one all last season and just put a brand new one on last week. Got it for a very good price. That's the only reason I bought it. Next time I will try something different though. Do you do a lot of wheelies/aggressive driving? 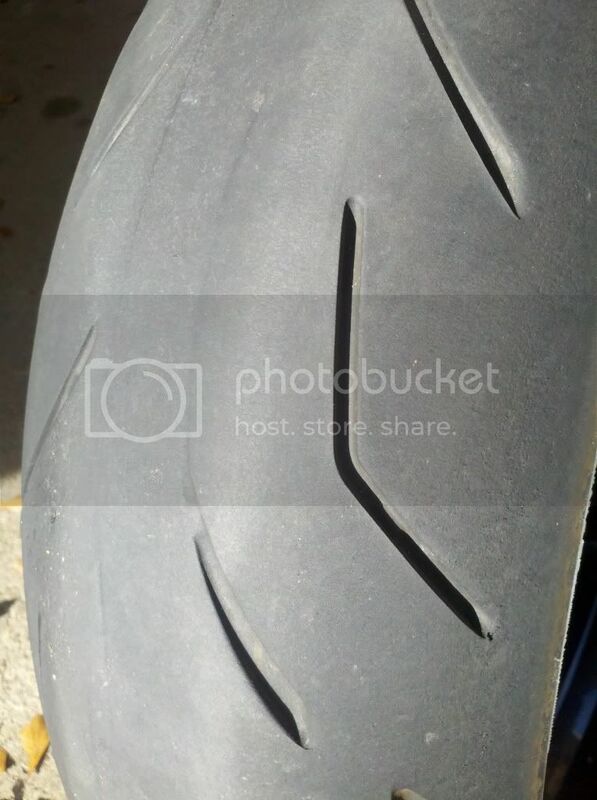 [quote=berencam;4799916]Well, after 3450 miles my S20s are toast. So i thought id shed a little light on them since I don't see many other people runing them. Wheelies, no. Burnouts, no. But aggressive riding, yes. Lots of back road carving. Some commuting mixed in also. 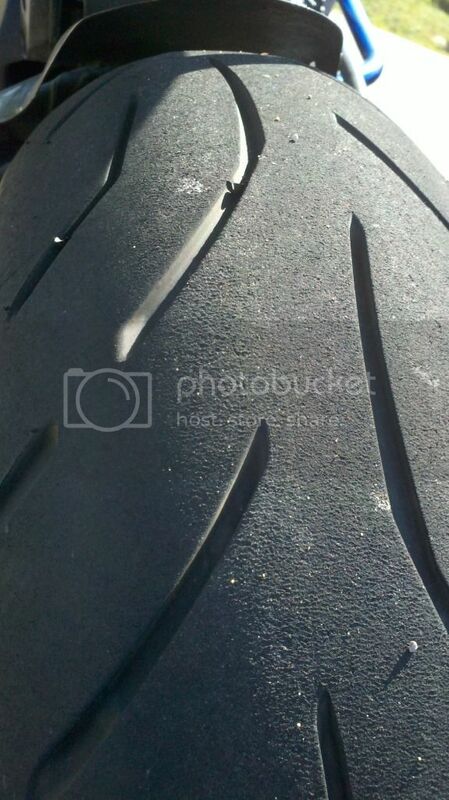 im trying to tell you for agressive riding and a good track day tire (fast pace) try the supercorsa sp's. 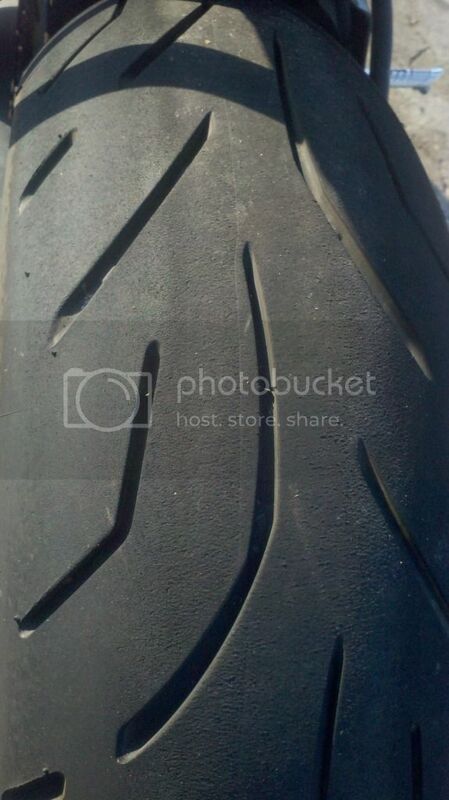 they have the same profile as the supercorsa race tires. turn in is quick, traction, feel and braking are excellent. id say as close as you can get before going dot race. 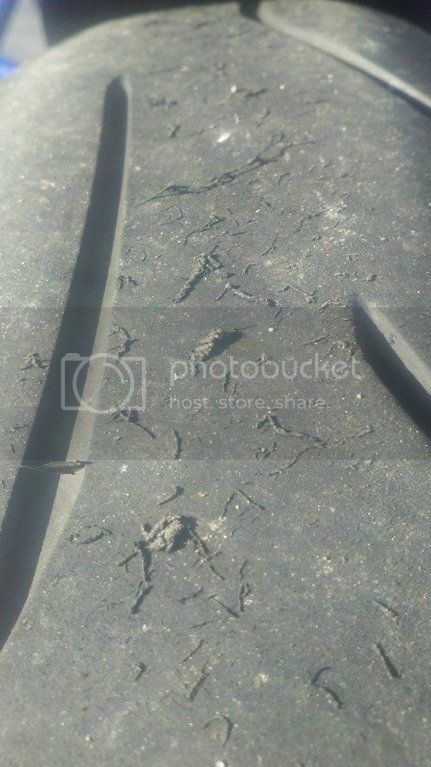 went from the pilot pures which are also a solid tire. 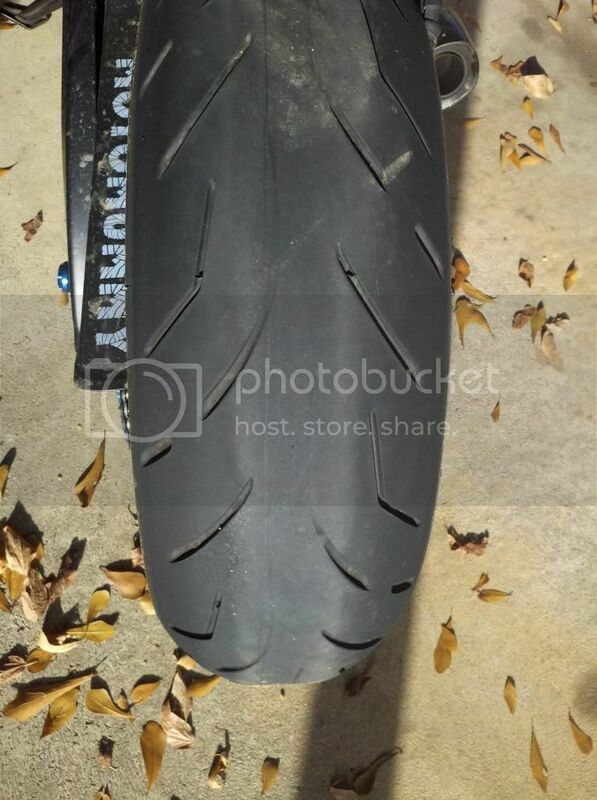 if i rate them a 7 out of 10 id rate these 9 out of 10. personally i think its the best non race tire out there right now. 1st time out on my favorite corners i was smiling and laughing inside my helmet because the diff in performance was that noticable. on my 2nd set, picked up version 2's. I just got home from Virginia (VIR north course) with CSS. Rode my own personal bike with S20's and the school bike with Q2's. Either tire would be a decent tire, but the Q2's have lasted longer for me. Did you notice slow turn in, when compared to q2s and other tires?